~ The rebuilding, restoring, repairing, and offshore sailing of a highly modified Cape Dory 36 sailboat. Please visit our other website that documents the six year rebuild and modification of the S/V Far Reach at www.farreachvoyages.com. 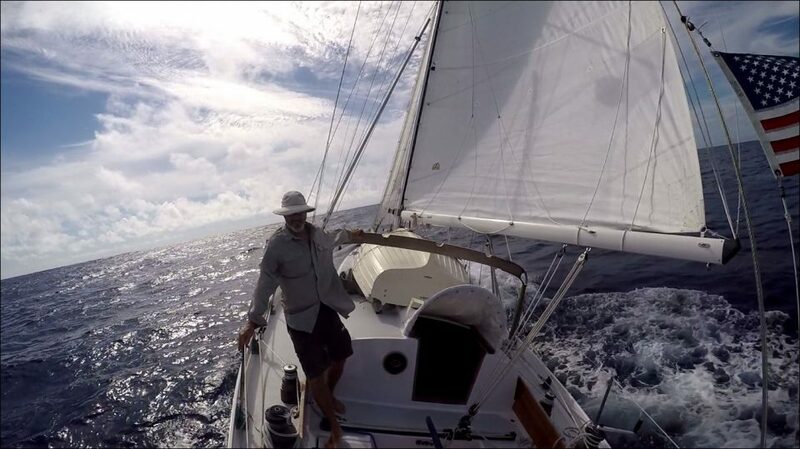 Here we are departing Hancock Marina on 29 Nov 2015 for the BVI. There was not a breath of air. We used the engine to get to the head of Adams Creek on the ICW that afternoon. The next day we sailed all the way down the ICW, under two bridges, and out to Cape Lookout where we waited for a weather window to cross the Gulf Stream. A few days later a friend linked up with us in the Bight at Cape Lookout and we transferred the engine to his skiff. We sailed to the BVI engine free. While I would prefer to have the Far Reach engine free all the time it would require access to a mooring that we could sail on and off. There are very few moorings in NC and none where we are. She is berthed in a small marina with 360° of protection. So, we often carry a Honda 9.9hp four stroke outboard on a custom-made removable swing arm bracket attached to the port quarter. The outboard allows us to more conveniently move her in and out of her slip, make the tight turn onto the fairway, then exit the narrow 1/4 mile long channel out to the Neuse River. I replaced the heavy and clumsy brass piston hanks on the stays’l with traditional brass luff rings. We use SS 7×7 5/16” wire rope for all the standing rigging on the Far Reach, except the forestay. For the forestay, we use synthetic 9mm Dynex Dux (heat treated dyneema). Recently, we modified the forestay to make it easy to detach it from the gammon iron. That modification allows us to open up the foretriangle making it easier to short tack as the forestay is no longer an obstruction to the jib. The modification, includes a partially covered dyneema that serves as a lanyard, and a few low-friction rings. On the left is the genoa with the zippered bonnet. At the upper left of the photo you can see the working jib clew cringle and just below it the leather cover that protects the zipper. You can clearly see the zipper running diagonally down from left to right. You might also notice there’s is no cover for the majority of the zipper. It seems to handle the loads just fine. I have been asked about our bonneted jib a number of times. I was asked about it again the other day on the Cape Dory forum. So, it seemed like a good time to provide more detail to those who might be interested. I like sailing with a hank-on jib. A hank-on jib is more efficient and longer lived than a furling headsail. It is less expensive. There is less maintenance required and it is more reliable. But it is not as convienent as a furling jib…no doubt about it. While there are techniques for managing a hank on jib that are tried and proven, it does take skill, occasional acrobatics, and some planning to keep things under control. Our genoa is about 390 sqft. But, it has a bonnet that we can zip off that reduces it to a working jib size of about 280 sqft. But, the challenges are similar with either headsail.